Iso-Protein is the 100% ALL NATURAL protein powder, perfect for maintaining a healthy physique and attaining a higher energy! Iso-Protein is highly unique; it is very low in carbohydrates and fat, but absolutely rich in essential amino acids, the very building blocks of protein's many benefits. Iso-Protein's uniqueness is further impressive in that it contains nothing artificial. Made from 100% CFM Whey Protein Isolate, the pure and gentle protein, for vastly superior absorption. 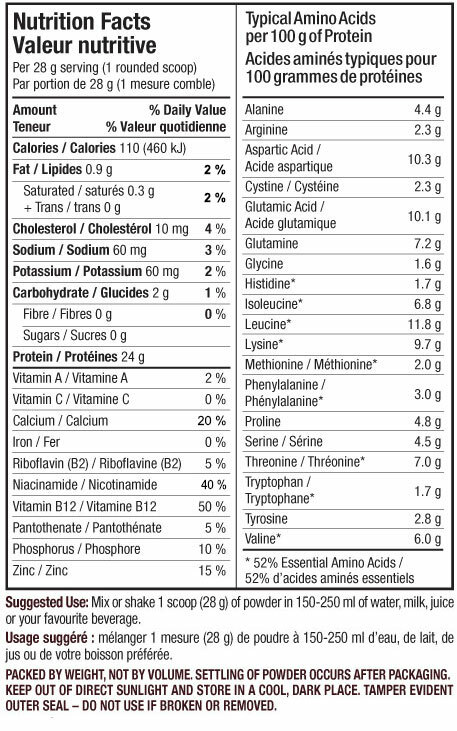 Contains powerful immune-enhancing protein fractions, exclusive to Iso-Protein's ingredients. Zero artificial anything - 100% Natural Guaranteed. Convenient to use; shakes up instantly with no messy blender. Suitable for all body types and ages. Iso-Protein is a great protein source that gives all these benefits, without adding empty calories to your diet. Iso-Protein is nature's food, just concentrated and made vastly more bioavailable, for maximum benefit! The exacting filtration method that Iso-Protein goes through, CFM (cross flow microfiltration) keeps the "smaller" vital proteins ("micro fractions") intact. These fractions can only be found in CFM whey protein isolate, and are responsible for whey's well-documented health benefits! Mircro Factions Found Only in North Coast Naturals Iso-Protein Beta Lactoglobulin: A complete source of amino acids, especially high in the sulfur containing amino acids (for repair), Cysteine and Methionine. Alpha Lactalbumin: Helps deliver more Calcium in the body for improved bone health, and extra Zinc for improved immune function. Helps ward off depression and elevates the sense of well-being. Serum Albumin: Contains a specific three amino acid sequence that is a glutathione precursor, to provide enhanced anti-oxidant protection & immune function. Immunoglobulins: These are major components of colostrums, integral to establishing a higher immunity level, protein uptake and superior tissue repair. Lactoferrin: Intact ONLY in CFM isolated whey protein, it is dominant in its affinity for iron which gives it strong anti-bacterial and free-radical destroying properties. Other proteins have to add this ingredient in; only Iso-Protein is naturally abundant in Lactoferrin. Lactoperoxidase: This milk enzyme enhances immunity by breaking down unwanted thiocyanate (from green foods) and hydrogen peroxide (produced by streptococci). Lysozyme: This enzyme hydrolyzes (breaks down) bacterial cell walls resulting in the death of the unwanted micro-organisms. Why the Micro-Fractions are Important — It's this one-of-a-kind combination of vital micro-fractions found in Iso-Protein, that may help provide greater resistance to diseases like hypertension, cancer, high cholesterol, osteoporosis, diabetes and heart disease. Ultra-CFM Whey Protein Isolate: ALL whey proteins are byproducts of the cheese making process. The liquid left over after cheese production goes on to one (or more) of several filtration processes. CFM filtration technology yields the purest powdered protein with the greatest immune system and overall nutritional value! 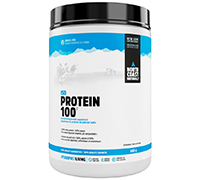 ISO-Protein is 100% CFM whey protein isolate, for true maximum benefit. Iso-Protein also contains small amounts of fructose, a naturally occurring sugar from fruit and corn that provides a natural alternative to common table sugar. Lactobacilli are a natural, GOOD bacteria for your intestines. Essentially they provide the healthy goodness associated with yogurt, yet are dairy-free and tasteless. These friendly bacteria protect the digestive system from "bad" bacteria, and also help improve overall digestion. A very important health-helper, especially for those who crave sugar & sweets. Inulin (Fibre From Chicory Root) is a fructooligosacaride (FOS), a fibre with impressive blood sugar stabilizing and digestive health properties. FOS is also a primary nutrient source for the "good" bacteria (the lactobacilli from above), improving the overall digestive tract health and efficiency. Isozyme (bromelain blend extracted from pineapple) improves protein digestion and assimilation, thereby making your protein more efficient. With only 100% natural, advanced ingredients, Iso-Protein is right for the entire family.